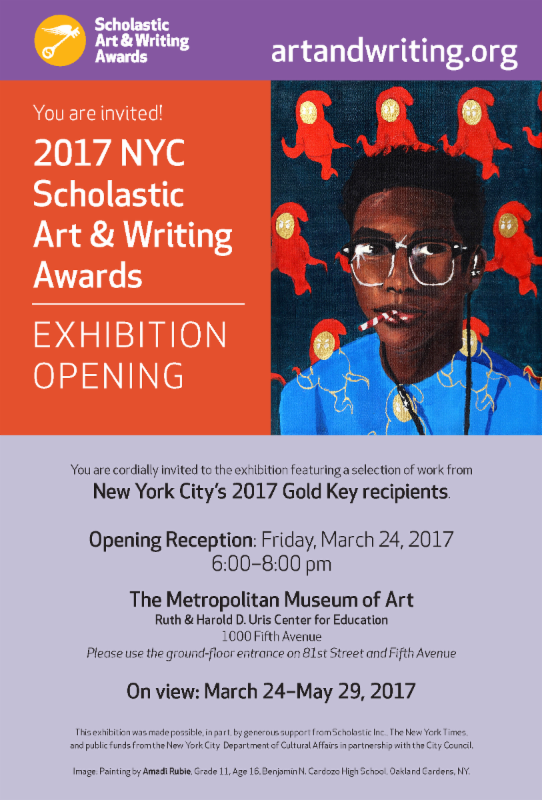 Congratulations NYC teen artists and writers! Gold and Silver Key awarded students and their educators will be celebrated at award ceremonies on Sunday March 19th at Parsons. Check your email for the invitation sent on 2/24 and RSVP today! The Certificate/Key pick-up station will close promptly at 11:15 am. Late arrivals should report directly to the auditorium and will be able to pick-up their certificate(s) and key(s) at the Reception immediately following the Ceremony. Gold/Silver Key recipients and educators should reserve tickets to attend the Art Award Ceremony and Reception. Each award recipient/educator may bring up to two (2) guests. Be sure to reserve a ticket for both yourself and the guest(s) who will be accompanying you. Check your email for your invitation. The Certificate/Key pick-up station will close promptly at 3:15 pm. Late arrivals should report directly to the auditorium and will be able to pick-up their certificate(s) and key(s) at the Reception immediately following the Ceremony. Gold/Silver Key recipients and educators should reserve tickets to attend the Writing Award Ceremony and Reception. Each award recipient/educator may bring up to two (2) guests. Be sure to reserve a ticket for both yourself and your guest(s). Check your email for your invitation. Gold/Silver Key Educators are invited to participate in a free workshop presented by Writopia Lab. Click HERE to register. Forward ALL inquiries about the workshop to Writopia Lab. #PERSIST Writopia Lab seeks Muslim, Christian, Jewish, Hindu, Buddhist, atheist, etc, teens to share their stories and insights in the form of spoken word on stage at the Nuyorican!